This chapter focuses on the findings on carers’ perspectives on the support provided by forensic mental health services. It explores forensic carers’ experience of and views on the journeys of their relatives into and through forensic mental health services and the impact on them, as well as carers’ experience of being a ‘forensic carer’ and how this impacts. 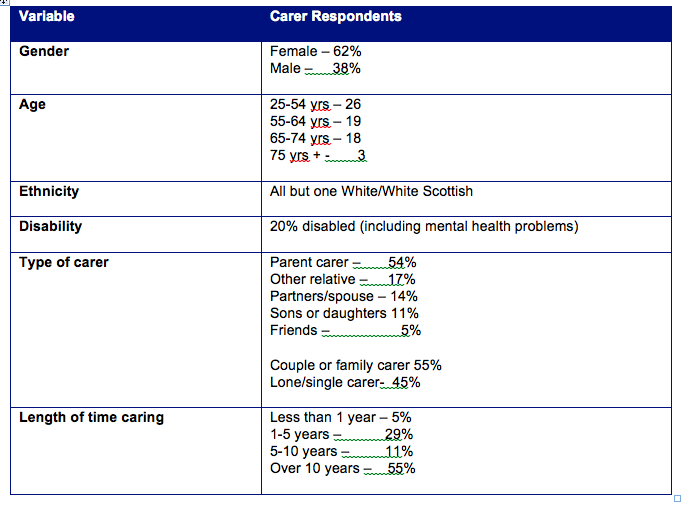 An overview of the carers who participated in the survey and interviews is given, showing participants in the study coming from diverse backgrounds and having experience of supporting relatives or friends in all types of forensic service, and from across the three Regions (North, South & East, West) and the State Hospital. Over a period of nearly six months, 66 carers replied to the questionnaire survey either online (21 respondents), or by post (45 respondents). Given that distribution of information about the study and paper copies of the questionnaire involved a number of routes, it is not possible to calculate a response rate with any certainty. However, previous estimates of the potential number of carers at around 500 would suggest a response from at least 10% of forensic carers across Scotland, which considering this a particularly ‘hard to reach’ group is a reasonable result. Although we would have liked to have reached more forensic carers, 10% was the minimum the commissioners had specified. The bulk of responses came from Tayside and the Greater Glasgow and Clyde areas, although as the table below shows the responses were spread across Scotland, with two from other parts of the UK. 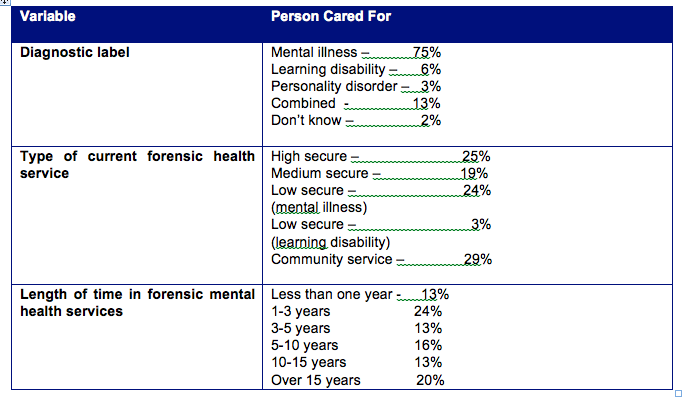 While questionnaire respondents tended to be female, were most likely to be mothers supporting a son in forensic mental health services and to have been caring for their relative more than 10 years, Table 9 below shows that the study captured a broad range of carer experiences and perspectives. Those who responded also varied according to the circumstances of the person they were caring for, along with the current forensic health service the person was in (see Table 10 below). Most were caring for a male relative diagnosed with mental illness currently in various forensic mental health services. The largest proportion was currently in community forensic mental health services, followed by high secure and low secure services for mental illness. They had been in forensic mental health services for varying amounts of time, but a fifth had been in these services for over 15 years. The sample, therefore, included carers who were both new to forensic mental health services, as well as those with several years of experience of different secure settings.